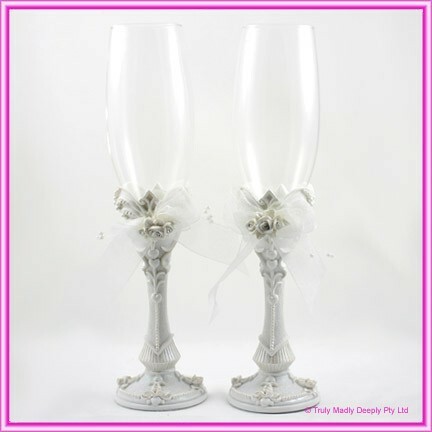 Lovely matching pair of wedding champagne glasses with a traditional elegant molded white rose stem, bow and a sprinkling of glitter. The glass can be engraved by any glass engraver. Comes in beautifully presented gift box with clear lid. The bridal toast is such an important photo and your own special glasses will make that photo all the more special. In addition, you can re-use the glasses on your wedding anniversaries. Matching Cake Knife & Server set, guest book and pen are available - see below for details. By the way everybody loved the invites. We received a lot of compliments which I have to to pass on to you. Thank you.